This rug is great. It is nice and plush. But it is a dark gray and not black like I thought, it still works. Magnificently constructed from polypropylene, this head turning Vanlose area rug from Carson Carrington will make a classic addition to your interior decor. The machine-made rug features an abstract Moroccan diamond pattern, allowing for contemporary style. This indoor rug will renew the atmosphere of your home. 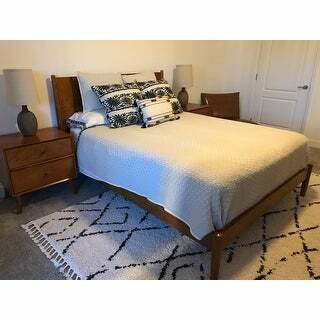 Well here is the beautiful Carson Carrington Moroccan Shag Rug that matched the Kate and Laurel Calder pictures and everything I order is never damaged and always received as scheduled. I plan on ordering another larger one for my Great Room. 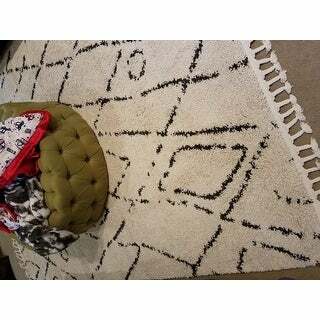 The rug is soft and the quality from Overstock is worthy for another visit. Was very pleased when l laying this rug out on my living room floors as the pics do not do the rug justice. 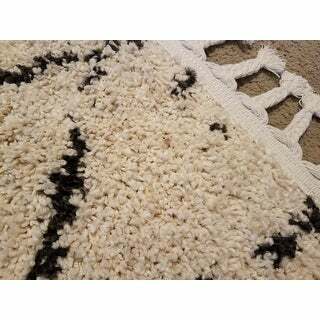 It has a luxurious feel, is soft, plush and exactly on point for a Beni Ouarain pattern. Many retailers would sell this rug for a couple of hundred more in 9x12 so I feel Overstock price was a bargain. The color is not an off white as pictured but a true ivory/cream (not white) so be prepared for this darker tone but a complimentary shade for MCM , farmhouse and industrial interiors. Thank you Overstock, couldn't be happier with this purchase. Oh my goodness! This rug is life! Soft underfoot, not pure white- so it will be great at not showing dirt and stains. I just unrolled it today, and for the price it can't be beat. 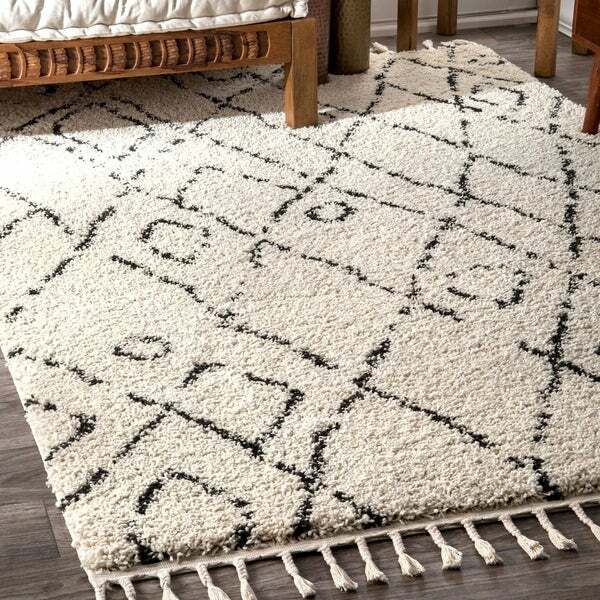 I've bought several similar black and white/ ivory rugs, mostly plush and shag, some wool(which shed horribly indefinitely) This rug is THE ONE- the perfect texture, size, color, material for our living room. I am so happy with this purchase. The tassles are the icing on the cake! No chemically smell, like you find on some synthetic rugs. I am happy. Option: Grey - 5' 3" x 7' 7"
Best rug ever. The pattern is not too overstated and the shag is a perfect length. I am a home stager and I own at least 5 of these rugs. They go with every style of funrishings. I love everything about this rug. I bought 2! One for my basement living area and one for my master bedroom. Looks great in both rooms. Adds a layer of warmth because it is so plush and cozy. Colors are beautiful. Rich cream color with warm blue tone. Love this rug -- beautifully made, super soft to walk on and reasonably priced. This rug is so soft and I love the colors. The tassels are really pretty and I love their detail. 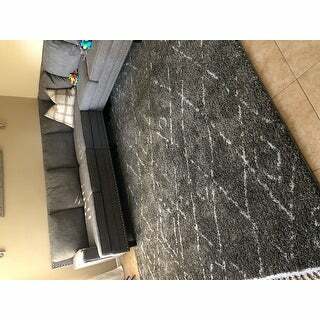 Good size rug and very well made. I like it because it goes with any furnitures and any colors. Tassel is good but the corners needs to take time to be flat. My husband and I purchased this rug for our sons nursery. And it is perfect! So soft and feels cozy in bare feet. It also has the best boho look we really wanted for our little adventurer. We recommend it highly! It’s also been crazy easy to clean. The kiddos love playing on it. I love this rug! The little frays are getting slightly worn. Just be careful when vacuuming. LOVE this rug. Perfect addition to my bedroom. Very soft and thick. Vacuums up nicely and the tassels are thick so you know they're not going to fray. I couldn't be happier with this purchase. Great rug, very plush!!! LOVE IT. Well made and very affordable, especially for the size. 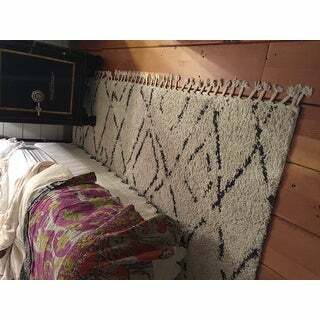 "What is your return policy if the rug doesn’t match"
"Does the overall length include the tassels?" The overall length does not include tassels. "DOES THE RUG HAVE THOSE BROWN FLECKS OR IS THAT JUST THE PIC?" This rug does not have the brown flecks. "Does the 9 feet include the extended tassels, or is that just the solid part of the rug?" The measurements of this rug do not include the tassels.